An interesting, none too technical (lots of pretty graphs) pdf presentation about the rapidly increasing demand for computer science programs in colleges across the US. Not only is the demand for actual degrees up, but the number of people who are even taking one or two courses to gain some experience in the field is up as well. I’d be curious to know if this trend is going to hold up. Will the generation of kids in our middle and high schools who are getting access to Scratch, Raspberry Pi, Arduinos, 3D printers and makerspaces continue along this route? 3D Printer Lessons and Unit Plans? I’ve had a Printrbot Plus in my classroom for this school year and I’ve grown into a big fan of both the technology and of Printrbot itself. I’ve been talking to Brook Drumm about 3D printers in classrooms. We started off putting together a google doc and looking for lesson plans and unit plans that could be used to introduce teachers to the technology and are printer agnostic. But I’ve got to admit, I’ve been surprised by what I’ve found. As with anything online, there are a lot of links that come up in a search engine, but what I’ve found is a mile wide and an inch deep. I haven’t been able to find much that is really good quality. But, the internet being the internet, I’ve probably missed about a million and a half things. – do have a lesson plan you would be willing to share on 3D printing? – do you have a link to a great blog post about 3D printing in classrooms? – what topics that you think should be covered when talking to teachers about 3D printing? Are you interested in pulling together a resource? Do you have something you can contribute? If you have something or if you are willing to help by writing a lesson or another resource of some kind, you can either let me know in the comments, shoot me an email: glassbeed at evenfromhere dot org or leave it on the google doc. We are looking to see what is out there and looking for a community of people willing to pull something together. A couple of years ago, Sara Bongiorni published a book called A Year Without Made in China. It followed her family as they attempted to get through an entire calendar year without using products made in China after discovering that most everything found under her family’s Christmas tree came from there. The digital equivalent would be a year without Google. Think of your classroom and your life. What would the tradeoffs be? Did I miss anything else major? Android devices and Chromebooks should be on this list too I guess. For about a year I’ve been working to wean myself off of my reliance on Google’s products. When I began to realize that they had my email, my documents, my entire search history, my RSS feeds and I was using their browser, it was time for a change. I’ve since switched to DuckDuckGo, I run my own email server and I’ve switched over to Firefox. A few changes. Nothing dramatic. The loss of Youtube in my classroom would be huge since I use it a lot for everything from 30 second video clips to longer documentaries. I’ve searched high and low for open source or self hosted equivalents to even just the Google Docs portion of Drive, but I can’t find anything. Losing that product would be a blow to collaboration in my classroom. As for the rest of it? Meh. I can find equivalents to almost all of it. I really don’t believe that Classroom is a transformational product. The “My worksheets are there!” type of enthusiasm just doesn’t say educational renewal and change to me. It may make things easier when it comes to handing out and collecting and collating digital worksheets and even communicating with parents, but it’s all walled garden to me. I’m hoping for more when it comes to changing education. A year of learning without Google. What would we lose? What would we gain? My wife was an early adopter of ebooks. Long before she had an ereader, she would purchase and download books to her laptop and read from there. The problem is that ebooks.com was sold. First to Fictionwise and then on to Barnes and Noble. So when she bought a new Macbook Air last week she was very surprised to find that due to upgrading software, changing companies and passwords moving from server to server, she could no longer access these books. 130 books she had legitimately bought and paid for that cannot be unlocked without an original password from a company who no longer exists from several computers ago. As the years go by, stories like these are going to be more and more common. Stowe Boyd has a new post about what he calls ” Freestyling.” The first in a series about work skills we all need for the future, essentially it is the idea that in many occupations we will need to work along side a computer that collects data and does the ” easy” work for us. He uses the example of humans that work with chess software to beat other teams even if they have much stronger players. Of course, this has me thinking about education. Data is everywhere. Apps and software, reading programs, Khan Academy and remedial math lessons all collect data on student performance. As teachers, I worry that in some districts, too many decisions are being made simply due to what’s been recorded by an app recording a child’s reading progress. I think that this will eventually lead to a charter school market in bespoke or handcrafted education, but that’s another story. I find Stowe Boyd’s idea interesting. It is more of a hybrid humans and data model that I’m not seeing being promoted in many places. In any case, his post is interesting and worth your time to read and think about if you I are in a position that makes decisions based on data points. I’m a Mac guy, but my classroom is filled with Windows laptops. That’s usually OK. I have to admit that I still love Microsoft Photostory. It’s an easy to use tool that introduces kids to digital storytelling techniques and options in a painless, I-don’t-need-a-ton-of-tech-knowledge sort of way. We’re working on Photostories in my classroom. We have been for about a week. Whenever we do anything like this, I like to show kids examples of work completed by other students. In a perfect world, I can find examples of work completed by students in high school, students who are probably a bit more skilled than my middle school kids. I want them to have something to strive for and reach for. But I’m finding a lot of dead links to files. I’m searching out teacher blogs, wikis and websites. In the searching that I’m doing, I’m finding a lot of spaces where teachers have posted films and photostories and audio files in the past. The teacher pages are still there, although many of them have not been updated for several years and the files themselves are missing; obviously having been taken down. I can’t find a lot of new content to show my kids. Completely anecdotal, but is this showing a trend in edtech? Five or six years ago, teachers were making digital stories with kids using an entire stable full of tools. Audio files, videos, animations, etc were fairly common to find online. Loads of new content could be found every few months. I’m not finding that anymore and I’m not sure what is happening. Are teachers doing less multimedia work in their classrooms? Is less of this work being shared online? Have edtech programs changed and teachers concentrating more on tools like Google docs, etc which are not shared as often? Are we working more in walled gardens? Teachers are sharing more in spaces like twitter, etc, but is there less work being shared out of classrooms? This is Where we are with Edtech These Days? Last week I picked on Google for promoting Classroom, a service that makes it easier for students and teachers to organize their worksheets. We always need to remember Seymour Papert telling us in 1971 that technology should help us reach (pdf) to do things differently in education. It should help us to be more creative in our classrooms and with the knowledge that we have access to. If you’ve spent any time with teenagers, or have teenagers of your own, much of this book will be familiar territory for you. She looks deeply at online spaces such as Facebook, MySpace and Snapchat. She talks about texting and Instagram. But the book is worth reading because Boyd looks past what we think we know. She has interviewed a lot of kids and looked beyond the headlines into uncovering statistics and root causes of things. Some people might be offended by this book since Boyd delves deeply into topics such as cyberbullying, inequality and online sexual predation, often rejecting conventional wisdom and the knee jerk political reactions we see around these topics. She doesn’t in any way dismiss any of these topics, but she does tell us that all is not as it might seem at first glance. These topics, well, they’re complicated and require some time and honesty to understand. 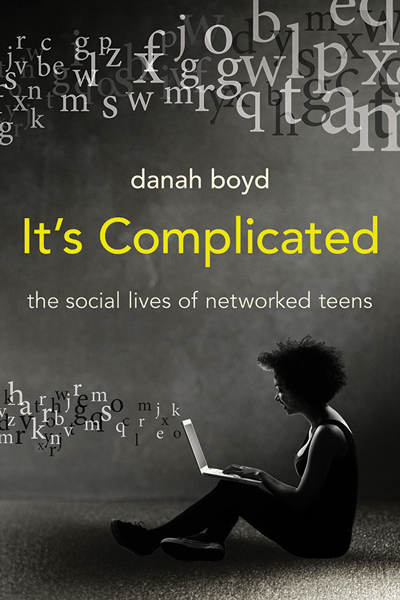 If you work with teens, I’d add this book to your list. It might give you another window into their lives and we all need that. Google has debuted a new ….. Besides being a nice commercial for Chromebooks, let me know if you see anything new here. Google has taken their apps, Drive and Gmail and wrapped them ever more tightly together. Here we have one of the world’s largest technology companies embarking on a major new education and classroom initiative – and it’s a place where students can find their worksheets. No wonder we can’t get the concept of educational change to meet the needs of a changing society into public perception. Geez, that didn’t take long. I should maybe go out and buy some lottery tickets. “The National Pupil Database (NPD) contains detailed information about pupils in schools and colleges in England, including test and exam results, progression at each key stage, gender, ethnicity, pupil absence and exclusions, special educational needs, first language. The UK government is offering this data up in a way that neither parents or students can opt out of. How long will it be until this includes data on internet usage, accounts, surfing habits, etc so that marketing can be targeted at specific students. glassbeed Had parent teacher interviews today. A number of parents concerned with their kid's tech usage at home: gaming time, phone, fb, etc. Trend? glassbeed @cogdog This is you earning your honourary Canadian stripes. I expect to see you start spelling words like colour and honour correctly next. glassbeed @mctoonish So you're no better off than we are then. glassbeed @cogdog -15C? That's gotta be colder than normal out there for this time of year? After all, the Okanogan is Canada's wonderland! glassbeed @cogdog If I poured kool-aid in the snow in my front yard you'd have some in about three minutes flat. glassbeed -37C today with the windchill. How bad do I really need groceriesâ€¦. ?